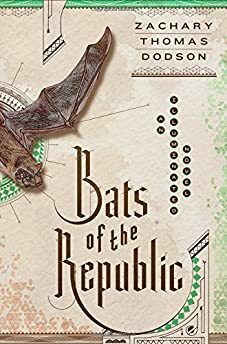 Largehearted Boy: Book Notes - Zachary Thomas Dodson "Bats of the Republic"
Book Notes - Zachary Thomas Dodson "Bats of the Republic"
The year's most beautiful book may be Zachary Thomas Dodson's innovative Bats of the Republic, a smart and illustrated dystopian novel. "Spanning 300 years of an American ancestry, Dodson’s ambitious literary debut combines elements of a Wild West adventure with aspects of a dystopian sci-fi thriller. By 2143, the U.S. is divided into seven city-states whose citizens fear the very government protecting them from the untamed world that lies beyond guarded walls. After his grandfather, a beloved senator, dies, Zeke Thomas earns a fledgling government title and receives a letter that disappears before he opens it. With suspicious government officials spying on him, Zeke spirals into a paranoiac frenzy after his partner loses her job and he discovers secrets about her father. In one analogous story line, among others, naturalist Zadock Thomas delivers a mysterious letter from Chicago to pre-annexed Texas, hoping to satisfy his sweetheart’s father, the curator of the Museum of Flying. A designer by day, Dodson lovingly adorns his novel with diagrams, wildlife illustrations, and other ephemera, relaying the branching narratives through letters, field notes, digital transcripts, and fragments of a novel-within-a-novel. Extravagant and mesmerizing, Dodson’s complex, evocative tale gradually reveals a mythos surrounding love, adventure, and the natural world." I spent six years writing and designing Bats of the Republic, so the amount of music played behind the scenes is not small. In the interest of constraint, I decided to filter my playlist through the lens of my favorite record label, Drag City. So, in no particular order, here are where Bats of the Republic overlaps with the output of that fine independent record label. I used the first two lines as the opening quote to the book. The story is about a naturalist in 1843 named Zadock Thomas. He must leave his beloved Elswyth in Chicago to deliver a secret letter to a Texan General camped one thousand miles away, on the front lines of the fight for Texan independence. The fate of the volatile republic, along with Zadock's future, depends on his mission. Three hundred years later, the world has collapsed and the remnants of humanity, clustered in walled-in city-states, survive in a strange society of paranoia. Zadock's ancestor, Zeke Thomas, has inherited an old, sealed envelope from his grandfather. When that letter goes missing, Zeke finds himself caught between government Lawmen and an order of mysterious Sisters–each with their own schemes in play. One of the primary things I wanted to investigate in the book was how we are or are not tied to, reflections of, echoes of, our ancestors. Given that our DNA is so similar, what accounts for our widely varying personalities and experiences? Is it culture, the time we're raised in, the people around us? I wanted to show two similar individuals in radically different settings, and see how that played out. The line also hints at the book's obsession with all things that fly. The rest of the song is great as well. The album too. Alasdair Roberts really captures and updates folk traditions in a way that feels fresh yet firmly rooted in the past at the same time. I listened to this album a lot during my early days of drafting. It was a direct inspiration for the book. Not the content exactly, but the complexity. The sense that here every piece is thoughtfully labored over, however delicate seeming, to create something vast and beautiful. Like a tablecloth of lace. I'm a fan of maximalism, and not that Ys is that, but the dense layers: her complex arrangements on the harp, backed up by the brilliant additions of Van Dyke Parks. Her vocals: strange and ever-shifting melodies, with intricate wordplay, obscure syntax and archaic word choice. The cumulative effect is an inescapable vision, and that, to me, was inspiring. She does a sort of world-building, in song. I didn't want to hold back when layering in details, or adding designs and illustrations, and diving down deep into some strange subjects. I spent a week reading about rotovators, and geosynchronous orbit. I don't know how that relates to Ys, but in my mind, it does. And everything with wings is restless, aimless, drunk and dour. Next comes “Butterflies and birds collide at hot, ungodly hours.” I was tempted to include that line as well. It's a song about sisters and Elswyth, Zadock's love interest, is left to care for her younger sister, Louisa. It the symbol system of the book, one is a butterfly and the other a bird. Their father is the proprietor of the Museum of Flying, an esoteric collection of anything that flies. When Zadock sets out on his errand, the museum is lacking bats specimens. He makes it part of his mission to remedy that. Also, in the song 'Only Skin,' she sings the line “Back on the patio, watching the bats bring night in.” Which is something I did with my best friend Sam, when we holed up in an empty house one hot Arizona summer to write. I worked on this book, he worked on his, and every evening we would stop and take a break to watch the sun set behind camel rock and have a drink out on the porch. As the light grew dim, little bats would start fluttering down from the mountaintop, right over our heads, snatching bugs out of the porch lights. In the future storyline, Zeke writes this line as part of a secret message (that the reader must also piece together from various parts of the book). Paper documents are banned, and Zeke and his girlfriend write notes to each other in dusty hidden spots, or in steam on mirrors and glass. The hidden, ephemeral nature of these message share something with this song. The (large, amazing) oeuvre of Will Oldham invokes an dark, quotidian mysticism. Folk ways are mixed with modern neurosis. Joya is a great album, it has this strange shabby back-handedness, and feeling of traveling, movement. As Zadock heads across the uncharted southwest death and disaster close in around him. He finds a bat cave, and retreats into its dark depths. Safe, but in a new kind of existential danger at the same time. Oldham's Joya would be a good album to listen to in a cave. Another companion album, this time near the end of the editing process, which felt like slowly chiseling extraneous parts of the book away. This album does not shy away from emotional end times. 'Baby's Breath' could be about the innocence of Louisa. It's a shifty song, seemingly about lost innocence or marriage too soon. In Bats of the Republic, marriage is problematic. In the 1840s the rituals of being introduced to society and courting are still in play. The two sisters I mentioned earlier are facing these same stricts social mores from different vantage points: Elswyth, the older, has waited too long to marry and her last decent suitor, Zadock, has just trompted out into the wilderness, almost certainly to his death. Her younger sister, Louisa, is a demonstration of just how dangerous it could be to wander outside of these conventions and buck the system. In the book as in this song the altar is somethings a marriage altar, sometimes a sacrificial altar, and sometimes disturbingly both. Not music, but a literary magazine that Drag City put out for many years. It was something that really got me into writing. As a teenager I was a huge music fan, and though I loved books, I couldn't identify my generation in them very often. I often wondered why people my age weren't writing books. The Minus Times was a revelation. It felt new and exciting in the same ways as the bands I was listening to. The first reading I saw in Chicago was a Drag City event. David Berman and Bill Callahan read. The Silver Jews played two and a half songs, and Will Oldham jumped on stage. It was great, and for me exemplified the potential of overlaps between the forms. The magazine also had many overlaps: musicians often contributed poetry or other writing. A few years ago, featherproof books, the small press I founded, partnered with Drag City to release an anthology of the magazine. Hunter Kennedy, the editor, sent me all the typewritten originals to scan in, and the entire and only archive was on my desk for a few weeks. During that time I was terrified my house would burn down, destroying the cultural artifact that I was trying to preserve. Luckily, we all made it out. And bonus fact: Patrick deWitt, the phenomenal author of Sisters Brothers and Undermajordomo Minor (almost out- the best spooky castle book I've ever read) blurbed Bats of the Republic - and his first ever piece was published by The Minus Times. A good one about love and longing. Zadock names his trusty steed Raison d'être, so that he never forgets that his mission is to return to Elswyth. Zadock and Zeke both head underground about 2/3rds of the way through the book. Zadock into a bat cavern, and Zeke into abandoned mines deep below his city. It's a surreal and uncomfortable experience for them both. The mood of this song is in the damp, stale air. The song ends with the refrain "We're trapped inside the song, where the nights are so long." Similarly, these two are trapped inside the book. All characters are, I suppose, but the nature of their trap is a little different, something that only the conclusion reveals. The end of the book is a sealed envelope, the one that Zadock has been carrying, the one that Zeke inherits. The reader has the actual thing in their hands too, so the temptation to open it must be resisted.